Alien Woven Portrait by Jane Landau, a handmade tapestry woven from silk and linen. This piece is part of a series of 'portraits' that evolved out of Jane’s interest in the woven Jacquard portraits of the 18th century and Bruno Munari’s book ‘Design as Art’. This design, created in Jane’s studio in North London, was inspired by depictions of aliens in film, exploring how their appearance can be often be so dissimilar and yet uncanny to our own. Material: Linen, silk & wood. Care Instructions: Can be dusted with a stiff paintbrush. The piece was hand woven on a 24 shaft loom using an ancient technique called Taqueté, which dates back as far as the 2nd century AD. The compound weave structure was adapted to allow Jane to work on the loom with relative freedom, using texture and colour in a similar way to paint and pencils. 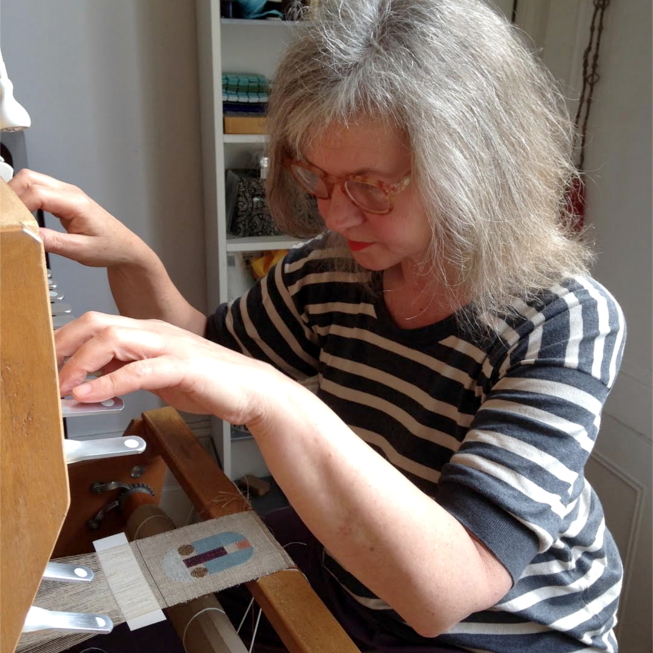 Jane Landau is a textile artist creating fine handmade tapestry pieces in silk and wool. Manipulating her medium to weave ‘sketches’, she has created a series of playful abstract faces inspired by the work of modernist visual artist Bruno Munari and jacquard weaving. Upon graduating from Camberwell School of Art, Jane moved to Paris, working and studying in the city for 26 years, before returning to set up her studio in North London. Jane Landau combines her design work with her role as specialist technician at the RCA.